First drive: Ford Fiesta TDCi Econetic | What Car? Step forward Fords new Fiesta Econetic a car designed to help you save planet Earth, but for once youll have fun doing it. Why fun? Well, green cars are usually a bit like medicine theyre touted as a cure-all for the worlds ills, but they dont taste terribly good because theyre so compromised by the changes that make them planet-friendly. 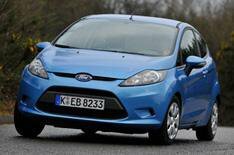 The Econetic is off to a good start because it has the superb Ford Fiesta as its basis. Ford has fitted lowered sports suspension, low-rolling-resistance tyres, made aerodynamic tweaks and reprogrammed the engines electronics to make the car use less fuel and produce less CO2. The question is, have the changes spoiled the Fiesta? In a word: no. The 1.6-litre turbodiesel engine is smooth and quiet, no matter how hard youre working it. Its a punchy unit, too, although things dont start to become interesting until the turbo starts to spin at around 1800rpm. Still, the gearbox is a joy to use. That sports suspension has a slightly adverse effect on the ride, only to the extent that you find the Econetic jiggling around when you hit any nasty urban bumps, whereas the standard Fiesta is more adept at dealing with ruts. While the Econetic does do a load more miles on every gallon of diesel, it costs a great deal more than our favourite petrol-engined 1.25 Zetec 5dr model. Youd have to do thousands of miles before the car would break even. Add in the fact that diesel costs significantly more than petrol, and youll have to do even more miles to make the financial case balance out. To cap it all, the petrol cars even tastier to drive.